Seriously, do you need to know anything more than the title? The big "what if" here is basically little more than Buffy the Vampire Slayer merged with the life story of the sixteenth president of the United States. Lincoln was born, fated as it were, toward a life of vampire killin' in the name of preserving the Union. Unlike Buffy, however, Honest Abe takes his marching orders from a master vamp who finds the purpose and methods of his Southern brethren reprehensible. Add a dose of revenge to Lincoln's early life and the tall, soft-spoken gentleman of our history books becomes the axe wielding vampire assassin with more blood on his hands, literally, than any other president in history. Oh yeah, there's blood alright. Red blood, and plenty of it. Seth Grahame-Smith, author of Pride and Prejudice and Zombies, has found in the life of Lincoln another ready-made mash-up for horror. By filling in known gaps in Lincoln's biography – particularly his early years – and by attributing the many personal loses in Lincoln's life to vampires and vampire hunting what emerges is one messed up history of what it might have been like if one had been called to duty in America's early history. And history, it turns out, was shaped by the activities of vampires who had fled Europe in search of a nation of easy pickin's. Grahame-Smith begins explaining how he came upon the "lost" journals of Lincoln that effectively fill in the gaps and explain the motivations behind troubling times. Henry Sturges, a shadowy figure, provides the journals but more importantly he was the gentleman vampire who guided Lincoln originally down his path of destiny. And why would a vampire aid a human in the cause against other vampires? Apparently there is a moral code even among vampires about who is and is not fit for consumption and those who prey upon the children and weak are looked down upon. Also, your history books never told you this, but evil vampires held sway over the South and used slavery as their cover for essentially keeping cattle farms available. This is the true battle between the states, with the North fighting to emancipate Southern slaves not so much to free them as people but to free them from the clutches of vampires. Until this last point is made clear – graphically so, I must add – the idea of "good" versus "corrupt" politicians as pawns in a vampire world makes for some interesting reading. I wasn't entirely comfortable with the demonizing that took place with the South because the implication is that wealthy plantation and slave owners knowingly fought not just to keep slaves for their own purposes but to keep them as feeding livestock. That said, I don't know that there's any other way to explain the Civil War in this story without drawing distinct lines between good and evil vampires, and the South takes a drubbing by association. 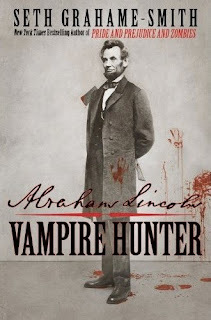 Abraham Lincoln: Vampire Hunter isn't without its historical cameos, not the least of which are the meetings Lincoln has with a certain Edgar Allen Poe. While Lincoln won't rest until he's killed every vamp on earth, Poe admires them (naturally) and the two men share philosophical discussions about their purpose in the world. It's interesting to see names from history appear and instantly begin to wonder: are they allies of vampires? Vampires themselves? Unwitting playthings in the vampire wars? Those looking for historical accuracy need not apply. I'm not just talking about the vampire inserts but the nitty-gritty of history that all of this is built around. To even the casual reader of Lincoln's life there are details fudged left and right in order to fit the story. Best probably to take this for what it is: a biography on the life of Lincoln from a parallel universe that mirrors our world, except with blood-sucking ghouls behind the scenes. The trailer for this book pretty much shows this will make an excellent feature film. Tim Burton is slated to produce. Hmmm. Really? One must look at it, if only to snigger gently up one's sleeve. I was wondering how this one was - thanks for the review! What am I saying. It isn't like kids who read this are reading it for the history. Right? Just finished reading it. Great book, great fun. Especially for early American History buffs. Yes, there are some inaccuracies, but the author does a good job of weaving vampires into Lincoln's life. It is what it is! Great fun!